Why Did No One Tell Army Officials at the Pentagon That the U.S. Was Under Attack on 9/11? A dozen Army personnel, including many senior officers, went ahead with a routine, previously scheduled meeting at 9:00 a.m. on September 11, 2001, in an area of the Pentagon that was severely damaged when the building was attacked at 9:37 a.m., even though a hijacked plane had crashed into the World Trade Center 14 minutes earlier and this incident had been reported on television since 8:49 a.m. Strangely, the officers were unaware of the crash when they went into their meeting and no one interrupted the meeting to let them know the U.S. was under attack after a second hijacked aircraft hit the World Trade Center at 9:03 a.m. They were consequently still continuing their meeting as if nothing was wrong, oblivious to the crisis that was taking place, when the Pentagon was hit and a huge fireball erupted into their room. Furthermore, as well as failing to alert the officers in the meeting to what had happened at the World Trade Center, the officers' colleagues appear to have failed to do anything significant toward implementing a military response to the attacks in New York. Instead, many of them continued their usual duties after learning two aircraft had crashed into the World Trade Center and it became clear that the U.S. was in the middle of a major terrorist attack. Additionally, they appear to have made no attempt to get out of the Pentagon and to somewhere safer, even though the building was a likely target for terrorists. PERSONNEL ONLY LEARNED OF THE CRASH AT THE WORLD TRADE CENTER SHORTLY AFTER 9:00 A.M.
Staffers were taking significant notice of what had happened. Antwan Williams has recalled "seeing people in the hallway and at their cubicles talking about what was happening in New York." "Everyone around me was talking about it," Lieutenant Colonel Victor Correa described. And yet no one interrupted the executive officers' meeting to tell its participants that America was under attack. And yet, despite learning that the CAT had been activated and, therefore, that the situation must have been considered an emergency, ODCSPER personnel apparently still did not think they needed to interrupt the executive officers' meeting to alert its participants to what had happened at the World Trade Center. Furthermore, Lieutenant General Timothy Maude, the Army's deputy chief of staff for personnel--the man who ran the ODCSPER--was informed about the first crash at around 9:00 a.m. and then turned on a television to follow what was happening. He should therefore have seen Flight 175 crashing into the World Trade Center at 9:03 a.m. and have then realized that America was under attack. And yet it appears he did not issue any orders to his employees about what they should do in response to the crashes: Sergeant Major Tony Rose recalled that he and his colleagues in the ODCSPER did not receive "any directive or caution" from their "higher command" following the attacks on the World Trade Center. Nor, it appears, did Maude interrupt the executive officers' meeting, to call on his employees there to assist the Army's response to the attacks. Additionally, Nancy McNair--the wife of Philip McNair, the chair of the executive officers' meeting--phoned Maude's secretary, Deborah Ramsaur, after seeing the coverage of the crashes on television, to alert her to what had happened. According to Philip McNair, Nancy McNair asked Ramsaur, "Hey Deb, are you watching what's going on?" Ramsaur wasn't watching TV and so didn't know what had happened in New York. Nancy McNair therefore "filled her in." According to Philip McNair, Ramsaur then asked, "Do you think I ought to go across the hall and tell Phil?" The two women debated whether Ramsaur should interrupt the executive officers' meeting and pass on the news, but decided against her doing so. "They kind of went back and forth and debated it, and decided not to," Philip McNair described. "They didn't have an idea that somebody was gonna hit the Pentagon, necessarily, so they thought they weren't gonna interrupt the meetings that were going on." And so another opportunity to alert the executive officers to the crisis was lost. Instead of taking immediate action to implement a military response, ODCSPER employees appear to have initially reacted with alarming indifference to the events of September 11. What is notable is their failure to take appropriate action in response to the attacks in New York. Strangely, some ODCSPER employees continued their usual, routine work, as if nothing important had happened, after they learned about the second crash and should have realized the U.S. was in the middle of a serious terrorist attack. Some ODCSPER employees thought, after learning of the crashes at the World Trade Center, that the Pentagon could also be the target of a terrorist attack that day and a number of them stated this concern out loud. If the Pentagon was a possible terrorist target, as these individuals correctly noted, everyone in the ODCSPER (and those elsewhere in the building) was in danger. And yet no attempt was made to evacuate the ODCSPER and get its employees to somewhere safer before the Pentagon was hit that morning. Had the meeting ended on time, the executive officers would have learned about the attacks in New York and may have been able to take appropriate action in response to them before the Pentagon was hit. They may have realized their building was a likely target and may therefore have tried to get away from their office space to somewhere safer. But instead, they were unaware of what had happened in New York and that the U.S. was under attack. "We did not know about the World Trade Center. We had no clue," Martha Carden commented. Consequently, the executive officers had no idea what had caused the explosion and created the fireball that erupted into their room. Why did ODCSPER employees apparently do little, if anything, toward implementing a military response to the crashes at the World Trade Center prior to the Pentagon being attacked? This was the most important day of their professional lives. Surely they should have been desperate to find out more about what was happening, should have wanted to closely monitor events, and should have wanted to respond immediately to the crisis. And yet many ODCSPER employees continued their usual duties or took the time to phone family members, even after they learned that a second plane had crashed and it should have been obvious to them that the U.S. was in the middle of a major terrorist attack. Why did ODCSPER employees fail to alert their colleagues in the executive officers' meeting to what had happened at the World Trade Center? Surely they should have felt it necessary to interrupt the meeting right away, so the executive officers could help the military respond to the attacks. In particular, why did Deborah Ramsaur fail to interrupt the meeting after the wife of its chair called and alerted her to the crashes at the World Trade Center, even though the two women specifically discussed whether she should interrupt it to pass on the news? Surely it should have been obvious to Ramsaur that she needed to interrupt the meeting. Why did ODCSPER employees stay where they were instead of moving to a safer location after they realized the U.S. was under attack, considering that the Pentagon was a likely terrorist target? Why did Timothy Maude--the man in charge of the ODCSPER--apparently fail to issue any orders to his employees regarding what they should do in response to the attacks? Surely he should have ordered them to take immediate action after he learned about the crashes at the World Trade Center, and/or he should have been concerned about their security and should therefore have instructed them to move to somewhere safer. And why did some ODCSPER employees think the explosion at the Pentagon at 9:37 a.m. was the result of an accident? Surely their first thought should have been that it was part of the attack. These questions need to be addressed as part of a new investigation of 9/11. We can, however, consider possible explanations for why ODCSPER employees acted as they did on September 11 based on the currently available evidence. WAS THE ARMY RUNNING A TRAINING EXERCISE AT THE PENTAGON ON SEPTEMBER 11? Chiarelli had taken over as the Army's director of operations, readiness, and mobilization about a month before September 11, and one of his earliest concerns after starting in the position was the CAT, which, he'd learned, had not been significantly exercised for about 10 years. He had therefore decided to run a "no-notice exercise" (an exercise that is conducted without its participants having prior knowledge of when it will occur) for it. Further details of the exercise are unknown. For example, Chiarelli has not revealed what type of aircraft was envisaged hitting the World Trade Center in the scenario, whether the exercise would have involved just one aircraft or more than one aircraft hitting the World Trade Center, or whether the aircraft in the scenario would have been hijacked or would have crashed into the World Trade Center accidentally. All the same, if the Army was conducting an exercise at the Pentagon on September 11, it could plausibly have been Chiarelli's exercise, moved forward to take place a few days earlier than originally planned, or it may just have been another exercise. If an Army exercise was indeed taking place at the Pentagon on September 11, which included the scenario of planes crashing into the World Trade Center, this might explain why ODCSPER personnel only learned about a plane hitting the World Trade Center at around 9:00 a.m., even though the crash of Flight 11 had been reported on television since 8:49 a.m. The reason for the delay could be that the exercise involved the scenario of a plane crashing into the World Trade Center at 9:00 a.m., whereas the real-world crash took place at 8:46 a.m. What ODCSPER personnel learned about shortly after 9:00 a.m. may in fact have been a simulated plane crash. If this was the case, it could mean that ODCSPER personnel were never told about the actual crash at the World Trade Center. If the Army was running an exercise at the Pentagon that morning, this could also explain the apparent indifference of some individuals to the crashes at the World Trade Center and could explain why ODCSPER personnel failed to respond to the attacks. This could be why, instead of promptly responding to the attacks, some ODCSPER employees continued their usual, routine work after they learned of the planes crashing into the World Trade Center. If they thought the crashes were simulated for an exercise, they may have felt it was unnecessary to respond immediately, if at all. This could be why ODCSPER employees failed to alert the senior personnel in the executive officers' meeting to the crashes. If ODCSPER employees thought the attacks were real, surely someone would have interrupted the meeting to tell its participants what was happening, so they could start monitoring events and responding to the crisis. But if ODCSPER employees thought the crashes were simulated, they would presumably have been reluctant to disturb a meeting of senior personnel when this may have been unnecessary. This could be why ODCSPER employees made no attempt to get out of the Pentagon before it was hit, even though the U.S. was under attack and their building, as "a major symbol of U.S. military power," was a likely target. If they thought the attacks on the World Trade Center were simulated, they would have thought workers at the Pentagon were safe. This could explain why Deborah Ramsaur was able to joke with Antwan Williams, even though she'd likely just been informed about the planes hitting the World Trade Center. If she thought the crashes were genuine, Ramsaur would surely have been upset and in no mood for jokes. But this would presumably not have been the case if she thought they were part of an exercise. Incidentally, it is worth keeping in mind that the exercise Peter Chiarelli had been planning was going to involve the Army's Crisis Action Team. So if ODCSPER personnel were aware of this, when they heard on September 11 that the CAT had been activated, the information may have reinforced the impression that an exercise was taking place. For ODCSPER personnel to have thought the crashes at the World Trade Center were a scenario in a training exercise, however, they must have believed the television coverage of the crashes they were watching was simulated. But surely they would have realized it was authentic? Unless, perhaps, they had seen realistic, well-produced simulated TV reports about terrorist attacks in previous exercises and this led them to mistake the genuine reports on September 11 for simulated reports. Another possibility is that the video ODCSPER personnel were watching on September 11 was simulated television coverage, which had been created for an exercise, to make it feel more realistic. This simulated television coverage might, for example, have been created for Peter Chiarelli's exercise, which is known to have included the scenario of a plane crashing into the World Trade Center. If ODCSPER personnel were indeed watching simulated television coverage, they may have been able to tell that it was artificial and this realization could have reinforced any belief they had that the attacks on the World Trade Center were part of an exercise. Curiously, it appears that no one from the ODCSPER has mentioned seeing President Bush delivering his speech from the Emma E. Booker Elementary School in Sarasota, Florida, in which he declared, "Two airplanes have crashed into the World Trade Center in an apparent terrorist attack on our country," even though this speech was shown live on CNN, CBS, ABC, NBC, and Fox at 9:30 a.m. on September 11, when many ODCSPER employees were presumably still watching TV. Is this because ODCSPER employees have simply failed to mention seeing this speech when interviewed about their experiences on September 11? Or is it because they were watching simulated television coverage that morning, and this simulated coverage did not include Bush giving his speech? If the Army was indeed running a training exercise at the Pentagon on the morning of September 11, this gives rise to other important questions, especially if the exercise included the scenario of planes crashing into the World Trade Center. For example, what specifically did the exercise involve? Who exactly came up with the idea for it? Which specific individuals planned it and who was running it on September 11? And why wasn't it called off after 8:46 a.m., when a plane actually did crash into the World Trade Center? Additionally, is it just a coincidence that an exercise based around the scenario of planes crashing into the World Trade Center was being conducted at the same time as planes really did crash into the World Trade Center or is there a more sinister explanation for this concurrence of events? Might the exercise have been intended to prevent honest and dedicated Army personnel from effectively responding to the 9/11 attacks, by causing them to mistake actual events for part of an exercise? If so, this would indicate that rogue individuals in the U.S. military were involved in creating the deception. Clearly we need a rigorous and unrestrained new investigation of 9/11 to address these questions, and find out exactly what happened at the Pentagon on September 11. Robert Rossow III, Uncommon Strength: The Story of the U.S. Army Office of the Deputy Chief of Staff for Personnel During the Attack on the Pentagon, 11 September 2001. Washington, DC: Department of the Army, Office of the Deputy Chief of Staff, 2003, p. 39; Stephen J. Lofgren (Editor), Then Came the Fire: Personal Accounts From the Pentagon, 11 September 2001. Washington, DC: Center of Military History, United States Army, 2011, p. 137. Robert Rossow III, Uncommon Strength, pp. iv, viii-ix; Linda Herbert, "The Day I'll Never Forget." Today's Christian Woman, September/October 2004; Alfred Goldberg et al., Pentagon 9/11. Washington, DC: Historical Office, Office of the Secretary of Defense, 2007, p. 36. Robert Rossow III, Uncommon Strength, p. 39; Stephen J. Lofgren (Editor), Then Came the Fire, pp. 137-138. Patrick Creed and Rick Newman, Firefight: Inside the Battle to Save the Pentagon on 9/11. New York: Presidio Press, 2008, p. 18. "8:48 a.m.-9:29 a.m." CNN, September 11, 2001; Alfred Goldberg et al., Pentagon 9/11, pp. 40-41; Patrick Creed and Rick Newman, Firefight, p. 19. Robert Rossow III, Uncommon Strength, p. 35. Stephen J. Lofgren (Editor), Then Came the Fire, pp. 135, 162; John Spong, "Karen Wagner's Life." Texas Monthly, September 2011. Earl Swift, "Out of Nowhere: Inside the Pentagon on 9/11." Virginian-Pilot, September 7, 2002; Robert Rossow III, Uncommon Strength, p. 21. Patrick Creed and Rick Newman, Firefight, pp. 18-19. John J. Kruzel, "Survivor Recalls Memories of Pentagon Attack." American Forces Press Service, September 2, 2008. Antwan C. Williams, "10 Years of Memories: ARSOUTH Officer Recalls Tragic Day for First Time Since Attack." United States Army South, October 7, 2011. Dean E. Murphy, September 11: An Oral History. New York: Doubleday, 2002, p. 230. Robert Rossow III, Uncommon Strength, p. 33. Ibid. p. 51; Linda Herbert, "The Day I'll Never Forget." John Spong, "Karen Wagner's Life." Kathryn Roe Coker, David T. Zabecki, and Deborah Foster-King (Editors), The Role of the Army Reserve in the 11 September Attacks: The Pentagon. Fort McPherson, GA: Office of Army Reserve History, 2003, p. 3. Robert Rossow III, Uncommon Strength, p. 64. Clyde Vaughn, interview by Stephen Lofgren. U.S. Army Center of Military History, February 12, 2002. Robert Rossow III, Uncommon Strength, p. 51. Stephen J. Lofgren (Editor), Then Came the Fire, pp. 162-163. "Remembering 9/11: Reflecting on the Day When Heroes Stood up Against Terror." American Military University, September 7, 2011. Stephen J. Lofgren (Editor), Then Came the Fire, p. 162. "Isabelle Slifer Shares Her Story." National 9/11 Pentagon Memorial, n.d.
 United States of America v. Zacarias Moussaoui. United States District Court for the Eastern District of Virginia, Alexandria Division, April 11, 2006. Linda Herbert, "The Day I'll Never Forget." Bernard W. Tate, "Pentagon Survivors Tell Their Stories." U.S. Army, September 14, 2011. "Myrtis Ann Parham." Los Angeles Times, September 11, 2002. Antwan C. Williams, "10 Years of Memories." Laura Moyer, "'We Can Never Forget.'" Fredericksburg Free Lance-Star, September 10, 2006; Stephen J. Lofgren (Editor), Then Came the Fire, p. 171. Richard T. Cooper, "Outside Pentagon, a Defenseless Feeling." Los Angeles Times, September 12, 2001. Andrew Gray, "Pentagon Sept. 11 Memorial Revives Painful Memories." Reuters, September 10, 2008. Dean E. Murphy, September 11: An Oral History, p. 230; "Frozen in Memory, the First Moments of a Transformed World." New York Times, September 11, 2002. Robert Rossow III, Uncommon Strength, p. 21. Robert Rossow III, Uncommon Strength, p. 129; Alfred Goldberg et al., Pentagon 9/11, pp. 42-43. Stephen J. Lofgren (Editor), Then Came the Fire, p. 145. Robert Rossow III, Uncommon Strength, pp. 39-40; Patrick Creed and Rick Newman, Firefight, pp. 18-19. "A 9/11 Pentagon Survivor Remembers and Mourns." Metro Connection, WAMU, September 9, 2011. Steve Vogel, The Pentagon: A History. New York: Random House, 2007, p. 436. Stephen J. Lofgren (Editor), Then Came the Fire, p. 148. "A 9/11 Pentagon Survivor Remembers and Mourns." Stephen J. Lofgren (Editor), Then Came the Fire, pp. 138, 148. Robert Rossow III, Uncommon Strength, p. 54. "Frozen in Memory, the First Moments of a Transformed World." Stephen J. Lofgren (Editor), Then Came the Fire, p. 66. Kathryn Roe Coker, David T. Zabecki, and Deborah Foster-King (Editors), The Role of the Army Reserve in the 11 September Attacks: The Pentagon, p. 4. Alfred Goldberg et al., Pentagon 9/11, p. 134. 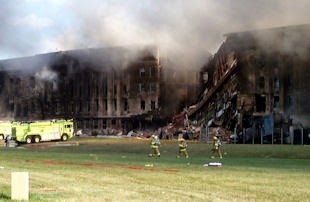 See "Army Command Center at the Pentagon Planned to Hold Exercise in Week After 9/11 Based on a Plane Hitting the WTC." Shoestring 9/11, March 26, 2011. Pete Chiarelli, interview by Frank Shirer. U.S. Army Center of Military History, February 5, 2002; Clyde Vaughn, interview by Stephen Lofgren. Pete Chiarelli, interview by Frank Shirer; Robert Rossow III, Uncommon Strength, pp. 64-65; Stephen J. Lofgren (Editor), Then Came the Fire, pp. 95-97. Stephen J. Lofgren (Editor), Then Came the Fire, p. 135. "9:12 a.m.-9:54 a.m." ABC News, September 11, 2001; "9:12 a.m.-9:54 a.m." CBS News, September 11, 2001; "9:12 a.m.-9:54 a.m." Fox News, September 11, 2001; "9:12 a.m.-9:54 a.m." NBC News, September 11, 2001; "9:29 a.m.-10:11 a.m." CNN, September 11, 2001. Was this Army exercise taking place early, on September 11? Shoestring on Fri, 03/06/2015 - 10:50am. Shoestring on Fri, 03/06/2015 - 10:53am. Jon Gold on Fri, 03/06/2015 - 5:42pm. Thanks Jon! I shall have to check out your interview with Malcolm Chaddock. Shoestring on Sat, 03/07/2015 - 3:55am. Thanks for another good article. Kevin Ryan on Sat, 03/07/2015 - 5:44pm. Thanks Kevin. Glad you liked the article. I was wondering a lot while I wrote this article whether some military staffers at the Pentagon were actually watching simulated TV news reports about planes crashing into the World Trade Center, which had been created for a training exercise, around the same time as the actual attacks on the World Trade Center occurred. Mosley mentions that his and his colleagues' reaction to the TV coverage of the crashes at the World Trade Center was: "That's a movie. That's fake." Might this have been because they could tell that what they were watching was simulated, i.e. it had been created for use in an exercise, to make that exercise feel more realistic? Of course, the use of simulated TV reports at the Pentagon on September 11 is just one possible scenario. But, if this is what happened, it would certainly help explain the poor response of the military to the 9/11 attacks. Shoestring on Sun, 03/08/2015 - 7:09am. was one of those inside the Pentagon, working, the morning of 9/11. She is African-American and a whistleblower who explained that she received no warning that she should evacuate the building, at all. IIRC, she filed a lawsuit regarding this matter, but it was thrown out of court. I have heard her speak and explain what happened to her in the Pentagon that day. She was injured, but her baby (who was with her that morning) escaped injury. ProfJones on Sun, 03/08/2015 - 10:14pm. I find it extraordinary that military staffers received no warning that they should evacuate the Pentagon before it was attacked. And yet numerous people have said they considered the Pentagon a potential--or even a likely--target for terrorists that morning. And yet, despite having this concern and despite his senior position in the Army, Chiarelli apparently made no attempt to instruct Army personnel to get out of the Pentagon. Shoestring on Mon, 03/09/2015 - 10:42am. One of my earlier blog articles provides further evidence that the Army may have had a training exercise scheduled to take place on September 11. Shoestring on Mon, 03/09/2015 - 10:45am.